A chasm, a gulf, a divide, a great difference in viewpoint exists amongst and between various factions in the climate change advocates and their views of the future sources of energy. This is not new; I wrote on SLB on this some time ago. And, the difference in viewpoint existed long before that. In short, there are two sides in the climate change debate: the warmists who fervently believe that man's use of fossil fuels is overheating the planet, and the realists who rest assured that any warming is only due to agenda-driven scientists who manipulate the data, plus a small bit of natural warming that has very likely ceased such that cooling has commenced. There are also two other camps, but they don't follow the dividing line just described. One camp insists that nuclear power plants for electricity generation must be constructed in great numbers and as soon as possible; those in the warmist camp that follow this line do so because (supposedly) nuclear power produces very little of that evil chemical, or pollutant as they like to call it, carbon dioxide (CO2). The other camp holds that nuclear plants for generating power are absurdly expensive, dangerous, and prodigiously wasteful of water that is required for cooling, and for those reasons should never be built, plus, the advances in renewable forms of energy are sufficiently great that renewables should be the generating sources for the future. As any followers of SLB already know, my description is of climate realist (there is no man-made warming except by way of data manipulation), nuclear power is absurdly expensive, dangerous, and wasteful of water, and renewable energy is indeed the way of the future. This article attempts to explore a few of the issues. A recent article (see link) in the UK's Guardian newspaper, authored by Naomi Orestes, argued for renewable energy as the best way to "decarbonize the economy," and not via nuclear power. Orestes is a confirmed and vocal warmist on the climate change issue. What is interesting is the direction in trends for costs of nuclear power (it is going up year by year) and renewables such as wind and solar (they are each declining rapidly year by year). The argument that is typically advanced for nuclear over renewables is that wind and solar energy are not reliable, not consistent, and therefore either fossil-fueled backup plants are required, or terribly expensive electricity storage is required. To a great extent the intermittency of wind and solar is true. Those issues can be (and are in some cases) minimized or made irrelevant by good engineering. For example, taller wind turbines reach faster and more consistent winds. Offshore wind systems have a much greater consistency and production. Thermal storage for solar energy allows generation after the sun sets. But, perhaps the biggest advantage of renewables is the opportunity to provide reliable, dispatchable power-when-we-need-it via a form of pumped storage hydroelectric. Massachusetts Institute of Technology, MIT, recently proposed (and has a patent pending) an under-sea hollow spherical storage system that is coupled to off-shore wind turbines. The electricity from the offshore wind systems pumps water out of the hollow spheres into the surrounding ocean, whenever the wind blows, night or day. When power is needed on land, ocean water then flows into the submerged spheres via standard hydroelectric turbines and generators. This provides reliable, on-demand power. With multiple wind turbines and multiple spheres, power is extremely reliable. SLB has a post on the MIT storage spheres from June, 2014, see link. With adequate economy of scale and cost reductions via experience and volume production, the added cost of the storage for wind energy will decrease. 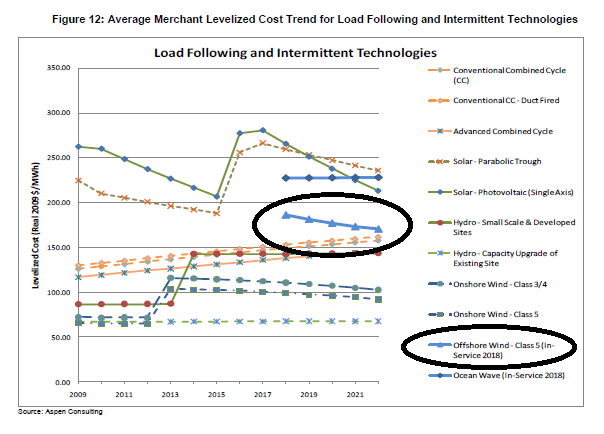 As shown below, the year-by-year costs of offshore wind are expected to decline (see Figure 12 below, taken from "COMPARATIVE COSTS OF CALIFORNIA CENTRAL STATION ELECTRICITY GENERATION" - January 2010. ) 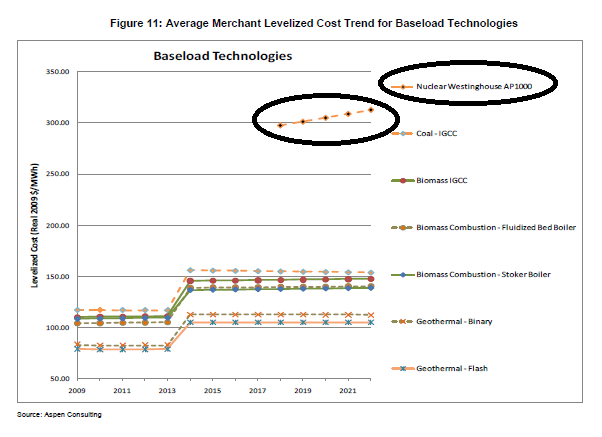 Also from the same source, and shown below as Figure 11, the cost of nuclear power is increasing. A question then remains of resource adequacy, as Is there sufficient wind offshore and / or onshore to provide the energy needs of the US, and by extension, the world? The answer is an unqualified yes. Per the U.S. Department of Interior, Mineral Mining Service, MMS, in their January 2009 "Draft Proposed Outer Continental Shelf Oil and Gas Leasing Program 2010 – 2015," there is plenty of power in the waves and wind offshore. “The U.S. Department of Energy (DOE) estimates that more than 900,000 megawatts (GW), close to the total current installed U.S. electrical capacity, of potential wind energy exists off the coasts of the United States, often near major population centers, where energy costs are high and land-based wind development opportunities are limited. Slightly more than half of the country’s identified offshore wind potential is located off the New England and Mid-Atlantic Coasts, where water depths generally deepen gradually with distance from the shore. Development of offshore wind energy technologies has the potential to provide up to 70,000 MW of domestic generating capacity to the nation’s electric grid by 2025." When the offshore wind resources are combined with existing onshore wind, hydroelectric, and solar, much of the nation's energy can be supplied without resorting to nuclear power or fossil fuels, should eliminating fossil fuels ever become necessary. It seems that the nuclear advocates are placing their hopes vainly on the costs of nuclear power plants somehow being reduced, yet the facts show that the nuclear plants cost more and more as they are built. Meanwhile, engineers are reducing the costs of wind turbines, and most importantly, increasing the height of the support towers so that larger and more economic turbines can be installed in the stronger, more reliable winds that exist at greater heights. The technology for the MIT storage spheres is nothing novel, simply reinforced concrete spheres with proven hydroelectric turbines attached. Finally, even though there is zero cause for alarm from man-made global warming, there is a serious need to de-nuclearize the power grids around the world in favor of safe, renewable, cost-effective renewable energy such as wind coupled to storage.